Santa is busy getting ready for Christmas when he finds out that not only is his own son on the naughty list, but there’s another Clause. This Clause says that he has to find a Mrs. and fast! Watch all the fun and magic as Santa tries to save Christmas by finding true love with these fun Movie Night Activities. 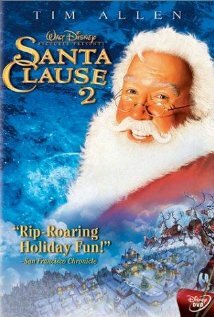 If you want more ideas or will be having a movie marathon, check out these fun activities to do with The Santa Clause. *Santa loves to taste test the cookies and hot chocolate at the North Pole. Serve up some of Santa’s favorite treats for your family to try out as well. *When Scott tries to ask Carol out on a date he wonders if she wants to go get some noodles and pie. She thinks that’s an odd combination and suggests thin crust pizza instead. Have a little of each, or choose whichever your family would like best and share a Scott Calvin Date Worthy Dinner. *Comet loves to eat treats and candy bars… so much so that he makes himself sick. Control yourself more than Comet did and let everyone pick one of their favorite candy bars to nibble on during the film. *Curtis loves listening to Christmas music and almost blows the secret of the North Pole by rocking out. Dance along with him or pause the movie and let each of your family members pick their favorite Christmas movies and share why they like it so much. *At the magical meeting, the Tooth Fairy petitions for a new name. Stop the movie and let each of your family members put in their best suggestions for the Tooth Fairy, or let them say if they would have voted for The Mola-nator or Roy. *When Scott goes to the faculty Christmas party with Carol, everyone loves the Secret Santa gifts he surprises them with. Have a small, surprise gift or treat ready to hand out during this scene to surprise everyone at your party as well. It could be a fun time to pass out everyone’s favorite candy bar, a small toy, or other present. *Charlie gets into a lot of trouble by spray painting different parts of the school. As a consequence he has to do community service and try to clean up some of the graffiti around town. Find a worthwhile community service project that your family can help with and enjoy the feeling of doing it because you want to help, instead of doing it because you got in trouble! *The elves love to play snow football and everyone ends up having a snowball fight to defend against the fake Santa’s Toy Soldiers. If there’s snow at your house, bundle everyone up and have your own frosty football game or snowball fight. If you’re not walking in a Winter Wonderland yet, have an indoor snowball fight by using Styrofoam balls or even crumpled up pieces of paper. *Charlie helps Principle Newman believe in Santa by showing her his magic snow globe. Use this fun tutorial and have each person in your family make their own snow globe to help them believe in the magic of Christmas. *LyndiLou* - Knowing isn’t a burden… it’s a gift!